Don’t let your cavalry units get separated from your main forces unless you are routing the enemy. A classic beginner mistake in most wargames is to over-extend your front both in terms of penetration into enemy ranks and spreading across the field to thinly. This notion is actually brilliantly captured in Battlelore through use of the supported units rule (See Jim’s Strategy below “Be Bold”). You want to ensure that you have the opportunity to attack as much as possible, but don’t do so at the expense of having a valuable calvary unit do a follow through maneuver just to take out a lowly green flag unit…you will likely be able to deal with that unit at a later time. Sometimes it pays dividends to reign in your horses (literally) and hold off on the follow up movements rather than plunging headfirst into the fray only to be cut off and cut down. Losing a blue flag cavalry unit while chasing down a green flag infantry unit is pretty much never a good trade-off. Because mounted units generally have less individuals than infantry units (those horses are big! ), they are actually someone easier to eliminate – you may need a better roll, but you need less of them. So be very aware of getting cut off and surrounded by pesky foot units. You will lose support, be unable to battle back, and get cut down by a propensity of dice. Sometimes caution is the better part of valour. Yes, the magic is fun. Sure, the monsters are cool. But when first teaching this game, it behooves you to really just get at the nuts and bolts of the game. Basic infantry and cavalry combat / movement resolution using the Commands and Colours cards. Stick to the basics for the first few skirmishes, even if you’re an experienced wargamer and then add the Lore components in later, if you wish. It’ll make learning easier and help you wrap your head around all the other rules that get added with Heroes, Creatures, and Lore. To keep things brief, I’ll assume you’ve read and understand the basic rules of the game. When you roll to attack your opponent, your chance to hit per die is generally 1/6 (16%) or 2/6 (33%) depending on the weapon your attacking unit has. One way to improve your odds is to bring out your red banner units to roll 4 dice when you attack. But why not improve your odds no matter how many dice you roll! By blocking your opponent’s retreat path, the flags you roll also count as a hit! (with exception to flags they can ignore if they are bold) This means your chance to hit per die is increased to either 2/6 (33%) when normally only the same banner color hits, or 3/6 (50%) when normally only the same banner color and bonus strike hit. When you typically roll only 2, 3 or 4 dice per attack, an additional 16% chance per die is huge. When a unit retreats it must move directly towards it’s starting side of the board. To block them from retreating, you simply occupy the two spaces directly behind them. Many times they will have one of their own units occupying one of the spaces behind them, so you simply fill in the other! If your opponent is blocking their own unit’s retreat path (they occupy both spaces behind one of their units), they will most likely be bold, but can only ignore one of your flags, so your odds are still improved! Never underestimate the power of a bold unit! For one, after your opponent attacks one of your bold units, your defending unit gets a free “battle back” attack if there is at least one man left standing. Since you can only order around 3 units per turn, free attacks are huge. Then there are the flag rolls and retreating. Being able to ignore a retreat against your bold units keeps you close to your opponent so you can use your next turn to attack rather than to just advance. An example of a good bold formation is to put a red short sword unit in front, backed by two blue short sword units. The red unit will likely draw the attention of the attack, and can battle back with 4 die (note this formation would hurt the red unit if more than one flag was rolled). Then on your turn you can move the blue units up and destroy whatever was attacking you. 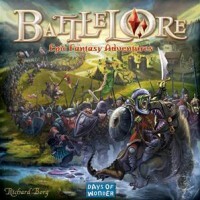 OK, Battlelore is hard to introduce to new people, especially because the first battle is Agincourt! The actual Agincourt was a slaughter (I think), so slaughtering a first time player is a ticket to playing alone. SO: for the first battle, have the two sides be exactly equal. Have archers vs. archers or horsemen vs. horsemen. This game is a blast when the two sides are neck and neck. It’s a drag when one side dominates the other. I also kept track of the battle results, so if one side won each time (ahem, dwarves), I would let them add an extra general. Simple as that. Bold units aren’t nearly as powerful if you wait for them to attack. I’ve won with goblins against dwarves just by doing that. One house rule that we use is that we keep in hour hands as many command cards as the units we command. Anhd every time a unit is lost we lose a cord too.